While we certainly don’t want to be accused of playing favorites, our boat building customers hold a special place in our lumber yard. Truly, these builders amaze us with the level of expertise and craftsmanship which these dedicated professionals bring to the deck. We realize that these uncompromising builders require top-grade materials in order to frame seaworthy vessels. 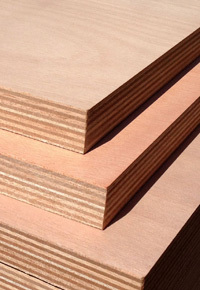 The requirements of their craft have prompted us to maintain an inventory of Bruynzeel marine plywood. We once encountered a customer using Holly and Teak plywood who complained of inconsistent quality of the Birch core as well as the quality of face veneer. In response, we provided a sample of Holly and Teak Bruynzeel on an Okoume (or Hechthout) core. One of the biggest benefits of using Bruynzeel is that the possibilities are nearly endless. Rather than a one-size-fits-all approach that leaves much to be desired, Bruynzeel offers a modular approach that allows us to customize plywood to suit each customer’s needs, on a case-by-case basis. We can provide face veneers in a variety of thicknesses. Sometimes, that means a balanced face veneer with a thickness that matches that of the inner plies; other times, as for wall-mounted panels, the extra thickness is unnecessary. For certain specialized applications, the orientation of the veneer becomes significant. 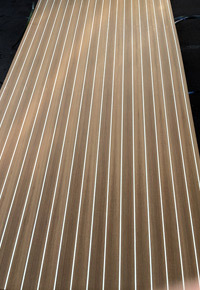 In the example cited above in which a customer required high quality Holly and Teak panels, the intended end use was a boat’s interior flooring. While the perfectly homogenous surface of Okoume makes it ideal for most marine applications, its softness (400 psi) requires it to rely on the strength of a harder substrate. Used for cabinetry, Okoume panels are great; for flooring, though, it’s not a reasonable option. Even using Teak (1000 psi) and a thicker 1.5 mm face veneer was not enough to make up for the core, since even the thicker veneer accounted for only 20% of the panel’s thickness. Instead of an Oukoume core, we suggested the other Bruynzeel marine panel, their Super Hechthout, which is comprised of Sapele (1510 psi). 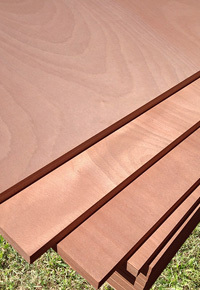 Like Okoume, the rotary-cut Sapele offers a defect-free surface. This option allowed our customer to pair the Holly and Teak veneer with the denser, harder core required for flooring. Between the Hechthout and Super Hechthout core options, we’re convinced that Bruynzeel marine plywood can allow for just about any marine plywood need to be met. Will Sapele Work Well for Your Next Job? As an active supporter of sustainable lumber practices, the J. Gibson McIlvain Company has provided fine lumber for notable projects throughout the world, including the White House, Capitol building, Supreme Court, and the Smithsonian museums. Contact a representative at J. Gibson McIlvain today by calling (800) 638-9100.